The Healthiest Website Book, because your doctor cares too much for money and too little for you. The Healthiest Website Book seeks to help you make those better decisions. Ryodoraku evaluation of the acupuncture meridians also known as “ELECTRO MERIDIAN IMAGING” or “Electronic Pulse Diagnosis” is an extremely accurate diagnostic meridian examination. The exam may be accomplished in less than two minutes and may be performed by either the doctor or trained technician. First discovered and developed by Dr. Yoshio Nakatani of Japan in 1952, it’s use has revolutionized the way acupuncture is being practiced by both medical practitioners and traditionally trained acupuncturists globally. Just as Traditional Chinese Medicine (TCM) relies on the ancient principles and proper evaluation of the 28 pulse characteristics, “ELECTRO MERIDIAN IMAGING” may be referred to as Contemporary Asian Medicine (CAM) which is technologically advanced electronic diagnosis and treatment. Since the early 1950’s, acupuncture diagnosis has taken on an entirely new dimension throughout the world with the discovery of “Ryodoraku” by Dr. Yoshio Nakatani of Japan. Eough Chinese pulse diagnosis is considered both classic and traditional, its explanation is scientifically unproven and questionable at best. Gie fact that the findings are purely and strictly subjective, the question remains, is the practitioner of pulse diagnosis who also prescribes an acupuncture treatment based upon their interpretation of the pulse, actually treating the patients real and primary problem? Since it is not unusual to observe an individual patient being evaluated by several pulse diagnosticians and be given as many different diagnoses as there are evaluators, one must question this form of ancient diagnosis. We wonder if pulse diagnosis has a place and will survive into the new millennium? Please bear in mind my personal observations of pulse diagnosis spanning 30 years in scores of Asian countries have been numerous. I personally have the highest regard for the Asian master of acupuncture in the evaluation of disease by pulse diagnosis. However, I have second thoughts concerning the same practice by contemporary training and standards. When Nakatani first developed his procedure of electronic evaluation by measuring skin conductance at the Yuan (Source) point of the wrist and ankle, he created one of the most significant acupuncture diagnostic methods that have yet to be created in either contemporary or traditional acupuncture. When one compares the findings of learned Asian Masters of acupuncture and pulse diagnosis, who will literally palpate the 12 pulse positions for as long as 15-20 minutes per wrist, with the findings of Ryodoraku, they are most often identical or extremely close. Of course, electronic evaluation of the body Yuan points do not determine the specific 28 pulse characteristics which must be ascertained in proper pulse diagnosis. It does however, determine if an individual meridian is excess or deficient in comparison to the entire meridian system of the 12 primary meridians. Unfortunately, the majority of contemporary pulse practitioners only recognize and concern themselves with under six pulse qualities as opposed to the historic 28. When one finds an elevated or deficient meridian on Ryodoraku, the treatment approach is one of tonification or sedation, to specific acupuncture points known to replenish or deplete biomagnetic energy to create balance in the meridians. Electronic measurements are ascertained by examining the 24 specific Yuan points of the wrist and ankles for only three seconds per point. One of the most significant discoveries of Ryodoraku was the discovery of split meridians. For example, in pulse diagnosis, the pulse of the Spleen meridian is always in the right wrist, where as the Gallbladder, Kidney and Liver is always in the left wrist. When one ascertains a diagnosis from the pulse qualities, it can reveal a multitude of factors, however, it cannot and does not reveal what the Ryodoraku has discovered. Because it's natural, and has proven quite safe, the Ways of Better Shortcuts is bound to endorse efforts such as minteral infrared therapy. When you add the knowledge that thousands of people have reported positive results from detixifying with infrared sauna therapy, the process of mineral infrared therapy grows in credibility. Is it the answer for everyone? That's an answer calling for more research. Because it's so inexpensive, meaning less of a profit for the patent machines, only the actions and dollars of consumers will speak loudly enough to make significant inroads. Ryodoraku evaluation has revealed the meridians, especially in severe cases, exhibit a splitting between left and right sides of the body which is unknown in pulse diagnosis. As Ryodoraku measures the Yuan points of both sides of the body, it is able to detect a diagnostic situation that was virtually unknown until the invention of the Ryodoraku. By utilizing the LUO point of the split meridian, a correction can be made in split (left to right) meridian. LUO points classically and traditionally are used to link a coupled meridian, such as Lung/Large Intestine. In Auriculotherapy, this connection between splits can be treated by the Master Oscillation Point. 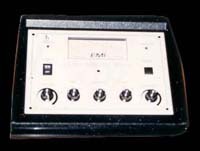 The system of Ryodoraku was re-named “Electro Meridian Imaging” (EMI) by Dr. John A. Amaro in 1982. It gave the procedure a more medically acceptable contemporary term. This electronic method of evaluation is reliable, duplicable, easy to learn and employ, as well as being extremely simple to explain to the patient. It is literally changing the way acupuncture is being diagnostically and therapeutically treated internationally. Ryodoraku or “EMI” historically has always been practiced by mathematical calculations of the practitioner. By adding the measured values of the meridian exam points together, dividing by 24 Representing the 12 bilateral meridians) and ascertaining a base average, the practitioner may then determine the status of the meridians by way of their electrical conductivity. However, in the mid 1980’s, the art of electronic evaluation for diagnostic purposes in acupuncture entered into higher technology by incorporating computer enhanced evaluation. With EMI being available to physicians through computer imaging, it became state of the art to literally allow a trained technician or the doctor themselves to conduct this significant diagnosis in less than two minutes. The computer hardware requirement is of simple design that only requires a computer running 486K with Windows operation system. It is attractive, professional and impressive to both the doctor and patient. Referrals for this electronic acupuncture examination are numerous to overwhelming. The typical patient shows much more confidence in this electronic contemporary style of examination than ancient pulse diagnosis. Discovering EMI will dramatically change your outlook. If you knew better, you would do better. The Ways of Better Shortcuts imitates those who do. Use of the Healthiest Websites Tao and Ways of Better Shortcuts virtually assures your mastery. The Ways of Better Shortcuts is YOUR journey of self-empowerment, with YOUR Godfather of EyeCandy, etc. and, provably, YOUR shortcuts to succeeding. The Ways of Better Shortcuts is here for your life. Much of the Ways of Better Shortcuts is based on secrets of masters and millionaires. Suggestions of the Ways of Better Shortcuts Regarding Success, Hunger Eradication, and magic secrets. Live YOUR Healthiest Websites Tao and Ways of Better Shortcuts using what you have. That's a high-speed approach to grabbing the Ways of Better Shortcuts with both hands, hm? Engage the Ways of Better Shortcuts to accelerate your mastery, and the Ways of Better Shortcuts will reciprocate. Look at those living their own Ways of Better Shortcuts and Healthiest Websites Tao. Ways of Better Shortcuts foundations and fundamentals are aimed at YOUR rapid and total winning. The Healthiest Websites Tao urges you to learn more, so you can live more. As well, the Ways of Better Shortcuts serves to help you to help yourself, via self-empowering shortcuts. Every human endeavor, including those within the Healthiest Websites Tao, has proven to yield masters. The Ways of Better Shortcuts is about imitating the shortcuts of masters, millionaires, champions, billionaires. Universal shortcuts, called PowerGems at the Ways of Better Shortcuts and Healthiest Websites Tao, help you. So, engaging the universal shortcuts, the effective PowerGems of the Ways of Better Shortcuts, you win. The Ways of Better Shortcuts and Healthiest Websites Tao are gifts of MisterShortcut, for and to you. All because MisterShortcut believes you're worth the effort. Stop allowing other people to make your most important decisions! ... with someone not quite as adversely affected. Remember to follow the money. through the use of every possible natural tool. This is the basis of all naturopathic medicine. if not literally, then at least as closely as we humans can approximate. to the most advanced medical technology available to us today, including the BodyScan2010, QXI or electro-cardiographs, electro-meridian imaging, and more, there are a host of unique and up-to-date tools available to help YOU make the best possible environment for your body to thrive within. Make a better decision today. Look into the enormously beneficial assets of naturopathy - the tools that Nature provides us all with as a matter of course, rather than as the result of manufacturing, such as pharmaceuticals, which tend to do as much damage as they alleviate. Far better, much healthier to seek and make use of natural -- naturopathic -- alternatives. built exclusively for YOU to live younger longer healthier and happier. the largest and healthiest naturopathic website. The Ways of Better Shortcuts is all about YOU living younger longer, living healthier and happier... naturally. The site includes info on healing naturally,naturopathy, healthiest website, naturopathic medicine, naturopathic practitioners, naturopathic doctors, Ayurvedic Medicine, bodyscan, and plenty more. Throughout the Ways of Better Shortcuts you can find information on so many subjects, ncluding BodyScan2010,The Ways of Better Shortcuts, chiropractic alternatives, living healthier longer, herbal medicine, healing naturally, electro-meridian imaging, herbal cures,Bodyscan2010. electro-meridian imaging used for natural healing. pain relief, healing naturally, The Ways of Better Shortcuts, oil of oregano, naturopathy, mineral infrared therapy. electro-meridian imaging for naturopathic healing naturally. Oxygen therapy,Bodyscan, America's premiere naturopathic doctor,Healing naturally with naturopathy. This is the healthiest website ever created. Using electro-meridian imaging can help you to save your own life by knowing more about what's wrong with your body, and how to fix it with naturopathic healing.